In 2000, the City of Toronto’s Air Quality Improvement Branch (part of the Toronto Environment Office) began employing air quality modeling to assess the city’s temporal and spatial local (i.e., neighbourhood level) air quality variability.2 The air quality model results revealed that Toronto had an air quality problem with fine particulate matter which exceeded the ambient standard concentrations both citywide and year-round. Limited provincial air quality monitoring data did not support the modeled result but was shown to have been collected too high above ground and too far from highways. A detailed literature review and scientific analysis revealed that fine particulate matter (PM10) is seldom found more than 3 meters above ground level unless significantly disturbed by strong winds.3 As such, monitoring data obtained at greater heights may not adequately portray the concentrations experienced by people who walk, cycle, drive or reside at ground levels. Air quality modeling as undertaken by the City of Toronto depicts the concentrations of ambient criteria air contaminants at the height air is breathed by people rather than the heights that are used to collect data to be correlated with epidemiological data to assess health impacts. On-street air quality monitoring subsequently confirmed the City’s air quality model results. The bottom line here is that concentrations of fine particulate matter in excess of the health-based standards are exceeded at “nose-level” across the whole of the city on a year-round basis. It is also very unlikely that the City of Toronto is any different in this than every other similar-sized city in North America. The “invisible contaminant” of fine particulate matter has indeed also been a “hidden issue” in that solutions to the issue were not readily understood or available until recently. So what is fine particulate matter? Particulate matter implies no chemistry within its description; it is defined simply by its physical characteristic. Obviously each particle has a chemistry, and often smaller particles, or chemicals, bond to the surfaces of such particles. And the chemistry of such particles does impact humans when breathed-in and eventually breathed-out (as with inhalable PM10) or breathed-in and stays-in (as with respirable PM2.5 which enters the blood system through the lung wall). But the bio-chemical impacts are simplified and related only to the surrogate of the size of the fine particulate matter. The most significant human health consequences of fine particulates are associated with cardio-vascular and pulmonary impacts. Though the respiratory impacts, such as asthma and chronic bronchitis, have, until recently, been thought the more significant, it has now become recognized that the heart and arterial disease-related cardio-vascular impacts are the more significant. Globally, fine particulate matter comes from a variety of natural and artificial sources. But in an urban environment, such as Toronto’s, the sources of the “coarser” fine particles (PM10) are largely from fugitive road dust and construction track-out; and the “finer” fine particles (PM2.5), which are also a subset of PM10, are largely the nitrates and sulphates created in the combustion of gasoline and natural gas—as come from tailpipes and furnace flues. Fugitive road dust is the by-product of the wearing down of road surfaces and vehicle tires as well as particles from brake wear and vehicle tailpipe emissions and is considered to be the most significant source of PM10 and PM2.5 in Toronto. If such fugitive road dust is not removed by sweeping or removed by rain events (or flushing), it remains on the surface to be reentrained and recontaminate the air and redeposited only to be reentrained every time a vehicle’s tires passes over it. The greater the traffic volume and speed, the greater the amount that is reentrained to be constantly present in the air. The roads with heavy and swiftly moving traffic see the most particulates reentrained to create the highest ambient air concentrations that impact motorists, cyclists, pedestrians and the occupiers of all adjacent lands. Air quality modeling had provided Toronto staff with a belated recognition of the magnitude of the problem in Toronto, but it was readily apparent that Toronto, as with all municipalities, being responsible for the “sweeping of streets,” could do something about it. Attempting to discover how well other municipalities handled the removal of fine particulate road dust led us to Rule 1186. Toronto staff were initially encouraged to learn that PM10 compliant sweepers could be purchased that could remove PM10 from city streets. The inherently implied “80%” of material removed was also considered very helpful. But subsequently, after analysing the significance of the Rule 1186 procedures, Toronto staff were concerned that the Rule was not readily applicable to the climate and situation, and the operational preferences, found in Toronto. The following were the major points of issue for Toronto: (a) the concept of paying for more expensive sweeper technologies that achieved PM10 compliance by picking up 80% of a mixture of sand and paint filler (97% sand and 3% paint filler respectively)—which could permit a sweeper to be PM10 compliant without having picked up any PM10—was unacceptable; (b) reliance on the need to apply water for dust suppression is not appropriate in Toronto which consistently has two months with average temperatures below freezing (January and February), and as many as 10 months of the year with some below-freezing minimum temperatures (and further that compliance could be achieved without any restriction as to the amount of water that could be applied during the test); and (c) road sweeping in Toronto (other than in the few remaining industrial areas) occurs on streets with curbs, and the City’s operational experience discourages any use or reliance of gutter booms with shrouds for dust suppression. Essentially, the City was unwilling to pay a premium for PM10 compliant machines that could only be compliant in the warmer months of the year, or that might be deemed compliant if they only picked up sand (i.e., if the machines did not actually remove PM10 from road surfaces). But the City did want to obtain sweepers that could demonstrably remove PM10 from roads and from the air. The City developed a testing protocol to evaluate the ability of sweepers (a) to actually remove fine particulate matter (PM10 and PM2.5) from road surfaces and (b) to do so without polluting adjacent properties and their occupants or other road users either at the time of sweeping or subsequently. A test facility was established in a large storage barn at Disco Road Yard, Toronto. A known and large amount5 of 100% “paint filler” with a median size of 3 microns was spread evenly by “consistent hands” in two thin 50m test strips. After a sweeper had swept the test track, the remaining residue of paint filler on the track, and the amount “blown” onto the adjacent sidewalk and warm-up track areas, was vacuumed by hand and the material collected was weighed. All sub-areas were vacuumed and weighed separately. The concentration of PM10 and PM2.5 in the air was monitored at all times prior to and following each sweeper test (eventually using 8 monitors to gauge longitudinal and vertical variation) and provided area-under-the-curve values to indicate how much material was “blown” into the air. Coupled with the weights of material vacuumed from beside the test strips a very good comparative picture emerged of the ability of individual sweepers to leave the air — clean! The Toronto Sweeper Testing Protocol was itself “test driven” (and refined) using several of the City’s aging mechanical sweepers and various new technology machines as were supplied voluntarily by several manufacturers. In addition to the testing protocol respecting fine particulate matter, an operational performance evaluation of the street sweepers was also undertaken. Toronto’s onstreet- sweeping evaluation tested a sweeper’s efficiency in satisfying several key operational-related requirements, including its maneuverability, its wet condition sweeping capability, its “dustless” mode capability, and its ability to pick up leaves as well as large and heavy debris. Further evaluations were undertaken respecting operator ergonomics, routine maintenance operations and part replacement deliveries. Fine particulate matter that is flushed into storm drains or is washed into them during natural rain storm events also pollutes water bodies. The City of Toronto’s Water Division and Transportation Services Division collaborated with the National Water Research Institute of Environment Canada on a collaborative multi-year study to evaluate the effectiveness with which the various types of street sweeper technologies can capture PM10 and PM2.5 particles and keep them out of the stormwater runoff. In order to demonstrate that “new technology” sweepers should be able to clean the air as well as clean the roads, an application of LIDAR6 was developed to enable us to see the otherwise invisible particulates. The technique was used first to “see” particulates in the air above roads and to help “see” the extent to which cars and other traffic disturbed particulates into the air. We also adapted the original concept to examine the extent to which different sweeper technologies “blew” particulates into the air. 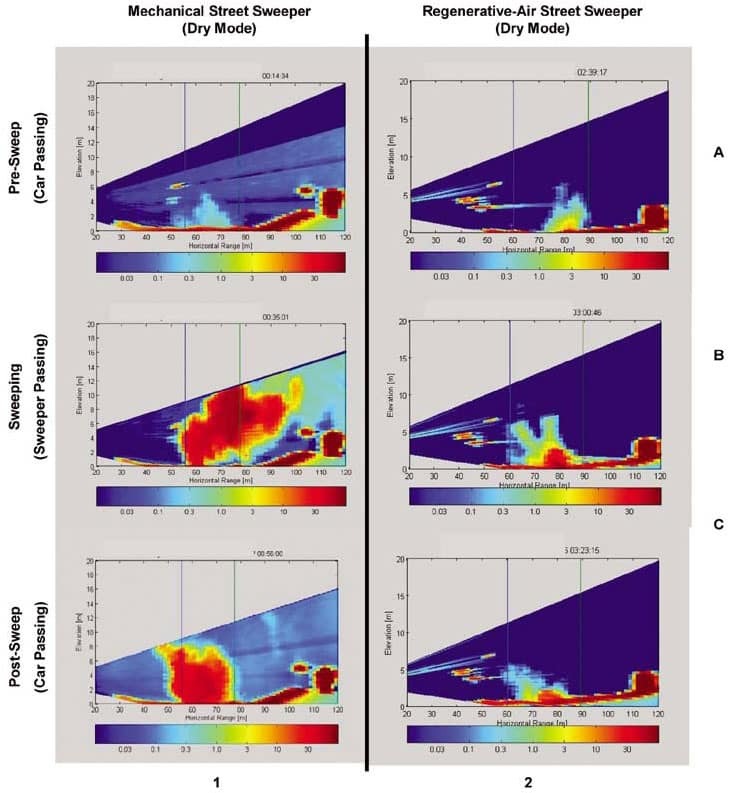 A procedure was developed using a closed urban road where (1) a car passed through the LIDAR beam; (2) after a 20-minute settling period, a sweeper “swept” its way through the beam; and (3) after a further settling, the same car passed though the beam once again and at the same speed. Several results obtained in this way can be seen in Figure 1 which shows a comparison between a mechanical sweeper (the type that performed best in the City’s protocol testing at Disco Road Yard) and a Regenerative Air Sweeper. Old mechanical sweepers were seen by their very nature to “blow” more particulates into the air than was acceptable. Closed system “dustless” Regenerative Air Sweepers were seen as a very major step forward7 for Toronto, one that cleaned the roads and cleaned the air to the City’s new performance standards. The City sees many diverse benefits in operating “dustless” Regenerative Air Street Sweepers, including: a significant reduction of airborne fine particulate matter at the level people breathe which will benefit the general health of the City’s residents, workers and visitors; an improvement in stormwater runoff quality and a reduced municipal cost of treating it; reduced sweeper maintenance costs; reduced sweeper downtime for unscheduled repairs; reduced amounts of locally “added” smog contaminants and reduced locally “experienced” smog impacts (which will potentially and appropriately also permit dustless sweeping to continue during smog days); and an improved level of street sweeping service to be provided across the City of Toronto and provided year-round. As part of the City of Toronto’s procurement process of new sweepers, staff incorporated the above testing and evaluation as part of its Request for Proposal process; this was in addition to the typical mandatory operational specification requirements. 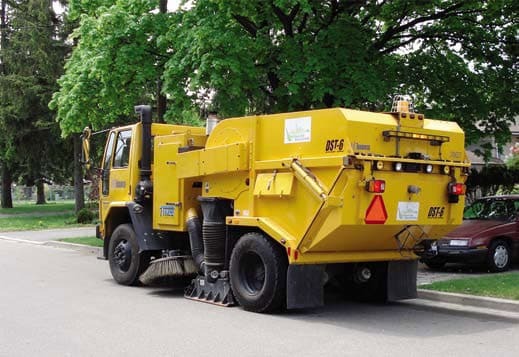 The testing and extensive evaluation resulted in the selection of a “dustless” Regenerative Air Street Sweeper, which met the City’s fine particulate removal criteria, as well as its operational and maintenance requirements. The City has purchased 25 such “dustless” Regenerative Air Sweepers and hopes to purchase as many more again in future in support of City Council’s newly and unanimously endorsed, combined air quality and climate change-related policy. The “Clean Roads to Clean Air” initiative defined a process that made it possible to obtain quantitative results of a street sweeper’s ability to “not pollute” the air and to clean the streets at the same time. The initiative provided the justification for the City to proceed with the acquisition of 25 “dustless” Regenerative Air Street Sweepers that can operate satisfactorily year-round. The testing protocols and criteria that were developed will provide the bases on which to objectively evaluate the environmental and operational performance of street sweepers as a part of future purchases. The evaluation process has provided a framework for the continuous development of new operational practices and procedures, ensuring that the City’s street sweeping service is delivered in a safe, environmentally sustainable, efficient and effective manner. This will be the standard by which we evaluate all our future sweeper purchases. In order to advance this standard with both the industry and the government agencies, Toronto has been working with Environmental Technology Verification (ETV) Canada and Prairie Agricultural Machinery Institute (PAMI) to evaluate, adopt and make available the above testing protocols to the industry. ETV is an environmental technology verification agency and delivers the Canadian ETV Program under licence from Environment Canada, while PAMI is an independent testing agency with experience and credentials in street sweeping testing. ETV and PAMI were contracted by the City of Toronto to review the City’s testing protocols as well as to witness the testing. They concluded that the protocols were fair, comprehensive in their process and properly executed, and resulted in a thorough evaluation of the street sweeper tested. A number of municipalities in Canada have already expressed interest in, and have indicated support for, adopting the Toronto testing protocol and criteria as a new municipal standard for street sweepers. Building on the success to date, the next phase of the initiative will be to further develop and incorporate “best practice methods” in the following areas: an Occupational Health and Safety-appropriate procedural review for the handling of swept materials and the cleaning of the sweepers; the temporary storage of street sweeping material or debris and its subsequent disposal; and the quantitative monitoring of the concentration of fine particulate matter in ambient air above city streets—this to confirm declining levels of PM10 and PM2.5 in ambient air over time, but also to ensure that proper operational procedures are being followed. Addressing environmental concerns, incorporating objective equipment performance evaluation, and introducing best practice methods in the delivery of future street sweeping will result in improved air quality and improved human health in the community, as well as improving stormwater runoff quality—all while delivering standard road cleaning in a cost-effective manner, year-round. The authors will give a presentation on this topic at the 2007 APWA Congress in San Antonio. Their session is entitled “Clean Roads to Clean Air Program” and takes place on Monday, September 10, at 10:30 a.m.
Fine particulate matter (PM) is “sized” in microns based on aerodynamic diameter. Normally, we speak of PM10, PM2.5 or increasingly PM1.0. Higher number sizes include the lower number sizes within them. As a point of reference, approximately 9,200 PM10 or 150,000 PM2.5 particulates could fit on the head of a pin (of 1.7 mm diameter), or approximately 285 PM10 or 4,600 PM2.5 particulates could fit on the period (of 0.3 mm diameter) at the end of this sentence. The Province of Ontario monitors air quality at four stations within Toronto. These stations provide general or average conditions but the AQIB was tasked to determine the local temporal and spatial variability and significance of air quality across the city. To which end, a Toronto-specific version of CALPUFF was employed to model current air quality and air quality improvements achieved under various scenarios. Watson J. & Chow J. (Ed) 2000 “Reconciling Urban Fugitive Dust Emissions Inventory and Ambient Source Contribution Estimates: Summary of Current Knowledge and Needed Research.” Desert Research Institute, DRI Document No. 6110-4F, May 2000″ reveals 80% of PM is found within 2m of ground level. Rule 1186; Appendix A can be found here. The large amount of material (275 kg) was used in order to provide a sufficiently significant amount of material to be removed in a sweeper’s hopper that could be measured as a “removed amount” when sweeper weights immediately before and after each test were compared. Subsequently, this weigh-a-sweeper-based process was dropped from the protocol in favour of alternate measures that had proven more accurate and reliable. But the large amount of paint filler was retained as we had already successfully developed many other measurements and practices based on the “large amount.” It would be possible to change to a smaller amount in future. LIDAR or LIght Detection And Ranging is similar to radar but uses monochromatic light frequencies rather than radio waves. The frequency of the laser was set to 1 micron with a fall-off that covered the range between 10.0 microns and 0.1 microns perfectly. LIDAR-based evaluation was also undertaken of various operational configurations, such as sweeping with and without water.